MANILA, Philippines — Diapers are primarily made to absorb pee and poo. But did you know that they can affect more than your baby’s hygiene? According to Go Naked: Diapers Affect Infant Walking, a 2012 study from the US National Institute of Health, saggy or lawlaw diapers can also hinder your child’s ability to walk properly. To find out if parents are informed of this fact, Rappler, in partnership with Pampers, conducted a survey among 1,200 readers who have kids in diapers. One of the most striking results of the survey is that most parents are unaware that lawlaw diapers can affect their child’s motor skills. It turns out that when it comes to choosing diapers, parents favor those claiming to be good for sensitive skin. Surprisingly, diapers which allow babies to move comfortably is the least popular option. What they don’t know is that babies need to be able to move with ease while they’re developing their motor skills. It’s not just their physical comfort at stake here, as most parents think, but their ability to walk properly as well. 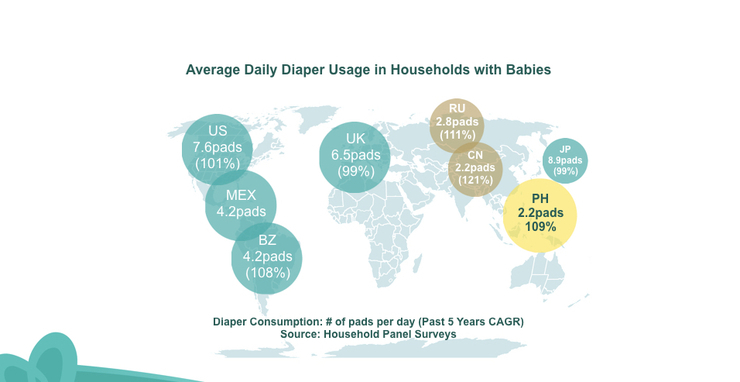 This is even more critical in the Philippines, where, according to a survey commissioned by Procter & Gamble, moms overuse diapers for extended periods of time, yet use those of low quality. Although a lot of parents consider saggy diapers an issue, only less than 8%, as previously shown in Table 1, believe that this can be a factor as to why their children can’t crawl or walk properly. This is alarming, because it’s important for parents to know exactly how sagginess is detrimental to the development of motor skills. Learning to walk without any bulk between the legs is best for your baby’s motor development. According to the Go Naked study, 13-month-old babies walked best when they are naked, while those who wear diapers have the tendency to stumble and fall. Babies are still learning to do a lot of things, including how to use their legs. If there are barriers like lawlaw diapers, learning to walk becomes even more difficult. The sooner your baby learns basic motor skills, the sooner they’ll be able to explore the world. Each child develops at their own pace, but your choice of diaper can either hinder or help your baby achieve important milestones. Your baby can walk with ease when you pick a diaper that doesn’t sag and offers protection against wetness. Avoid low-quality diapers which become bulky because of poor absorption. With those, pee and poo are not evenly distributed, so the wetness becomes concentrated in just one part of the diaper. The extra weight creates bulk, sagging between the baby’s legs — this causes the diaper to become lawlaw. Worried about spending more on high-quality diapers? Though they may come with higher price tags, you can actually save money when you invest in them. With quality diapers, you can spend less because you won’t have to change them as often. And according to the survey conducted by Rappler, 38% of the respondents agree that higher quality diapers are better deals since they end up using fewer pieces in one day. When your child wears diapers that absorb well and evenly distribute wetness, you won’t need to replace them as much — which means you can save more money. Less lawlaw diapers promise not only better development, but better value. Throughout the years, babies’ demands change, and diaper brands need to keep up. Recent innovations in the industry include Magic Gel channels, a new technology created by Pampers. These channels distribute wetness evenly and allows the diaper to remain thin and comfortable, protecting your baby against lawlaw and leaks. When your baby can move around without being saddled by lawlaw diapers, they’re free to explore independently. #ChoosePampers so you and your baby can say goodbye to lawlaw, and hello #GoGalaw all the way! Visit the Pampers Facebook page to learn more.